WUWT is a finalist in the 2011 "bloggies" awards | Watts Up With That? I was very surprised to learn today (almost a week later) that WUWT has been nominated for Best Science Blog in the 2011 Bloggies. This is like the Superbowl for bloggers. This nomination was done by a blind vote of some 200 people that got nomination ballots. I’m up there with HuffPo, Wired and many others in this award contest. Who isn’t on it is equally interesting. Please read on for info on how to cast your votes for WUWT and other bloggers. This weblog award is a little different than the previous one seen on the sidebar (which closed last year because the organizers couldn’t get the system working right)…recall the Climate Audit/Bad Astronomy horserace from 2007 that continued to get votes after the ballots closed, requiring a tie to be called. In 2008 (voting in 2009) WUWT won, but there were other problems. So they closed shop in 2010. Voting in this contest requires you to give an email address and complete a captcha, so it may be less prone to ballot stuffing. 3. If you want to vote for WUWT, click on the little grey circle in the lower right, and it turns into a checkbox and greys out the other thumbnails. Note the contest rotates the thumbnails for fairness in placement, so it may not look like the image order above. 4. Scroll up/down. Vote for any other blogs you like in any other categories the same way. You don’t have to vote for other blogs, as the system doesn’t require it, but please do. These other bloggers work very hard to deliver a quality product. Reward them if you feel they deserve it. 6. Complete the captcha by typing the words displayed in your browser (not the ones above), put in a VALID email address. Press the yellow SUBMIT button. Note- you won’t get spammed by doing so. See the fine print under the email box. 7. Wait for an email in your inbox. That email contains a link to verify your vote. If you don’t get it within a half hour, check your spam filter. 8. Click on the link in your email to verify your vote. It will take you to the verification page on the website and you’ll get a success message. 9. Spread the word! Twitter, Facebook, mailing lists, friends, comments on other blogs, and most importantly, if you run a blog, I’d welcome a posting on this topic. You know that some others who dislike what we do here will try to create anti-vote campaigns as they have done in the past. Success depends on whether there are more people who view WUWT as a science resource versus those that simply want to haul out the hate, and slap on the “denier” label. 10. Remember, while winning is fun, as I tried to teach my son in the recent pinewood derby we did, the way you play the game is just as important. Don’t cheat. Don’t encourage cheating, and simply let the chips fall where they may. It’s an honor just to be nominated, especially when some other prominent blogs in our circle of influence were not. UPDATE: Ah, well, what can I say? The childish hatehate has already started over at BoingBoing in comments. ← At $4.4 million per mile, a road to snow-where? Hey Realclimate, it must be your technique at getting your message across. I suggest a full re-vamp of how you present your alarmism. I’m sure lots of recognition is just a tweak or two away. Have no fear. My vote is yours and yours only, together with some of my trusted friends who can be relied upon to do the right thing. It’s funny. The more they try to stifle, the stronger we become. The wool is being lifted from the publics eyes. At almost 70,000,000 hits, it is clear that the public in general is not buying the lies foisted upon them by the deceivers. The explanations provided are not making sense to the average joe (and josephine). Expect more vigorous defamation of skeptics, however, everything that they say now seems to be working against them. Done already! Fingers crossed. Anthony, I’m sure I’m not alone in wondering how best to help you out materially for those of us who have no time for moderating or writing entries for your blog. Do you need donations for the surfacestations project, or would it be better to visit your store? I’m happy to keep flinging funds if that’s what’s needed most. This site is so important, and it would be nice to be able to compensate you and your wonderful moderators for all you do. Congrats on the nomination – fully deserved after a busy year on various fronts. Done and done, with pleasure. They could try: Doom and Love. What’s with the Pioneer Woman. It’s been nominated in at least five categories including Best Blog. Wow! Congrats. The truth will out. I’ve voted, good luck WUWT!! Anthony, it’s an honor to participate in your WUWT blog community! I’ve spread word of WUWT among my scientific & business peers and will gladly give you the vote, because you certainly have earned it! It never ceases to amaze me at the high-level scientific discussions we have, with Leif, Ellis and others regularly contributing. Even your trolls are (usually) pretty sharp! Keep up the good work! Done! The best science BLOG going. And that IS settled! Bishop H said I should vote – so I have! I always read this excellent blog after I’ve read his excellent blog. So very many blogs that were unfamiliar. Is there a way to find these blogs, or blogs within certain categories, without prior knowledge? Voted , but not verified yet . Why do they make the words you need to type in so hard to read . Mission accomplished — I think. I wasn’t even aware that the Weblog Awards are on again. Now that I know, I’ll ask my alma mater and friends to help out. I’ve already cast my vote. It’s E-Z! Be careful not to use your cursor keys to scroll. It changes your vote! Congratulations are in order, Anthony. It is well deserved. I’ve been haunting and commenting on scienceblogs.com for about 6 years. There’s a reason I chose WUWT as my main hangout and it’s because this is the best of the best for a number of reasons ranging from outstanding moderation policy and practice to scope of the science that appears to the breadth of knowledge displayed by most of the regular and irregular commenters. Good job. You deserve the recognition. BTW, CakeWrecks is an excellent food/humor blog. Good luck, I hope WUWT takes home yet another award. WUWT gets my vote for its hard work, honesty and interest. Its good to see the Alarmists being frozen out. All five choices for best political blog are left wing? Brilliant nominating process. 200 “randomly selected” voters just happen to settle on choices from only one side of the political spectrum. Any fan of those sites hate your guts, Anthony. I wouldn’t waste too much time on this one if I were you. We already know WUWT is the best! If you’re using hotmail go straight to your junk folder, do not pass go, for the Weblog ballot verification email. The verification appeared almost instantly in my hotmail junk folder. Voted and verified. Good luck to WUWT!!! Glad to vote and wow, it looks like there are a lot of blogs to go visit. I’ve only seen about four or five from the list before. First and goal, Mr Watts, first and goal! Your Website certainly deserves the recognition, as the “BEST” in it’s field. Job done, I’m just waiting for the Email to verify – best of luck. Done. Good luck Antony! You and your team of moderators deserve it! Great job for last several years. likely house the largest and most easily accessible collection of current scientific images, animations and data on Earth’s Climate System ever compiled. Well deserved. Bravo for the nomination! I received an email confirming my vote had been posted . I then had to confirm it by going to the link provided. My vote goes to your site. Keep up the good work. Your ballot has been verified. Check back on Sunday, February 27 to see the winners! Consider my ‘X’ duly scrawled. I’ve come to expect fun to read posts from WUWT regularly, but this still surprised me. Honestly, I love you, dude. Although there isn’t a shred of humour in it, the reference pages alone ought to earn you an award. Congratulations on the nomination and put another vote in the WUWT column. It’s good to be on the winning side today! I’ll vote for the blog for science, but sure wish I could dump on it for politics. i don’t think you should hesitate to REALLY promote this. keep it stuck at the top or give updates as often as you want, we won’t be bothered. i would LOVE for Watts to get this! My vote for WUWT cast and verification e-mail received in under 30 seconds here in England at 2300hrs on 06/02/2011. Look at all those little other blogs trying to compete. Maybe you should pull for them instead Anthony – everyone likes an underdog. A couple hard luck stories about accidentally posting on a slightly contentious pro-warming paper or fourth hand smoking which held them back. I voted for WUWT! As I have said several times, WUWT is writing history, WUWT is writing the book on how to DO SCIENCE and defeat the falsehoods and lies from the OLD ACADEMIA. WUWT is THE NEW ACADEMIA, hundreds of times more effective than the OLD ACADEMIA that costed us $trillions and gave us all that PSEUDOSCIENCE. WUWT is DEMOLISHING the Old Academia. Keynesian pseudoscience is even WORSE than AGW pseudoscience and already took $trillons from people (keynesians says that government “saves” the people from crisis while the truth is government POWER, CONTROL & TRILLIONS in taxes created almost every crisis). Remember keynesian Jeffrey Sachs “slimy” article against WUWT? It is not surprising that keynesians attack WUWT, the demolisher of PSEUDOSCIENCE. In economics the fight is much BIGGER than this fight. The work by WUWT and other similar blogs has been so AWESOME that the co2 demonizing pseudoscience is already near full discredit. CONGRATULATIONS! Just checked WUWT’s rival blog… for the first time ever. Not an impressive lot the competition, I must say. Pharyngula, Bad Astronomy and Eruptions would be worthier opponents. And those two microbiologist bloggers who sank overnight NASA’s grand, ‘peer-reviewed’, ‘alien life possible’ announcement. Voted. Well done so far Anthony – I thought I was the last person on earth not to believe in CAGW until I discovered your site. Voted. Thanks for the heads up on the awards. I have voted for WUWT. Your instruction, as always, is excellent. “X”ed and verified. If any one deserves it, it is all at WUWT. And what does that spell? Open debate. For those of us who are not comuter geeks WTF does that mean? There is simply no comparison between WUWT and Pharyngula. I have never witnessed at WUWT the disgusting things that are a regular occurrence over at Phyrangula. And I very nearly passed up this voting session for just that reason. Nothing like the taste of bile to turn you away. I went back and voted anyway. After verification I then added the site to the filters in my firewall. done. annoying site however, it jumped around very jerkily. also using the rolling wheel on the mouse to scroll down changes your vote also. The email confirmation does not confirm who the vote was for, so you have confirmation that you have voted, but not who you voted for. Unless you go back to the top via using the scrollbar arrows at the right of the screen, before you click confirm, you may actually not have voted for WUWT. Done, with pleasure. I may need to get more of a life though…. WUWT and the lefty political blogs were the only ones I recognized. Someone upstream mentioned that the political blogs were all left wing. Well, check out the religion blogs, nearly all atheist, apparently no certified theologians allowed. But, it does prove that anyone can blog about anything regardless of their background. Add my vote to the total. It is amazing that you made it through nominations frankly. I note the absence of many quality blogs that would be there but for their apostasy. Truth be told, the final result doesn’t matter to me, as I already consider you a winner Anthony. Congratulations on a job well done sir! Anthony, I hope you once read “Atlas Shrugged”. One of its recurring puzzles is why leading industrial figures simply disappeared. Likewise, the number of good science blogs is falling. I remember discussing the demands of running as blog with you in Melbourne. Jeff I understand, Steve is a central plank, hopefully doing other things before resuming. I’m not picking favorites, there are other excellent blogs unnamed here. So, in giving you a well-earned vote, I do hope that you have the strength and circumstances to continue. So much has been done, still more needs to be done. Congratulations on the nomination. It’s deserved. i nominate the bloggies website for the worst website award. have voted 3 times in two and half hours and still no verification. have to go offline so will check later to see if my vote has gone through tho, as others have said, it won’t prove i voted for WUWT. u r the best anthony. don’t know how u continue but beg u to stay the course. but my vote is for WUWT. …have voted 3 times in two and half hours and still no verification…. Yes – I’m using MSM’s Hotmail and the verification email went to the “Junk” folder. I tried, but the website is not friendly to Firefox in Linux and would not take my vote. Congratulations Anthony! The affirmation of decent ordinary people matters so much more (infinitely so) than lists put out for propaganda purposes – hi there Nature Climate Change. Please share a virtual toast with us across the ether! Voted hours ago and no verification email received – and nothing in Spam, either. Guess I’ll have to try again. Tried again and received verification email within a few seconds… Goofy. I voted. Good luck Anthony, it looks like some tough competition. Will send my blog readers to vote. OK, WUWT really was my choice in Sci. Then I really did look over the other categories to see who else deserved a vote. I’ve barely even heard of just a couple of them. Good Dog, I don’t even have an online life. if they don’t reply will try and vote again tomorrow. Yea, I noticed that every political plog up for nomination was a liberal one. Voted but no email to my gmail acct…I’ll give it another few hours and then vote again. I thought it was hilarious that all the political were lefties and the Canadian really obscure. Plus, who is The Pioneer Woman and how did she get so many nominations. Done during the adverts between 3rd and 4th quarters of the Superbowl, yes some of us Brits do watch it! Happy to vote for such a wonderful site. You are making history and I thank you for it. In honor of the Chicago “Big Snow II”, vote Early and Often! Hah – just kidding. I have but one vote, and WUWT it is! It’s a joy and honor to have posted some goodies on this site, and I thank Anthony for his hard and wonderful work putting this blog together and getting the good word out there. Entertainment for those not watching the Police State Bowl. Voted, waiting for verification. Seems to take some hours to respond. They did say to wait a day before calling back to check. Done. Sad to say, but the other blogs just aren’t my cup of tea. Voted, but I had to recycle the words 3 times to get a pair I could read, and still got it wrong. Then recycle another 2 times to get another pair I could read before finally getting it right. How do we vote down sites that require this time consuming guessing game? One more vote for WUWT. I’ve voted. Hope you get the award. I do have to put in another request, however. I noticed that Hyperbole and a Half is also up for awards in several categories. I discovered this incredibly wonderful and hilarious cartooning/blog/whatever about six months ago and am a total addict. This is so far above the average “humour” blog as to be in its own category. The fact that she regularly gets over a thousand comments per post should be an indication of her unique standing. Please look in on her site. If you do, I doubt you’ll have any problem casting some votes her way. She’s in several categories, so scroll down. PS: I have no affiliation with her. I couldn’t even tell you her name (although I’m sure it’s there somewhere). I just have a love of truly great humour. And there’s far too little of it, especially among humour bloggers. Voted for WUWT. Anthony, keep up the good work. I had no trouble using Firefox running on XP. I do know that sometimes Firefox doesn’t work on some sites, but seldom these days, then you have to use IE but that wasn’t the case here. Indeed I have had problems with Firefox in the past but I can’t really remember when: certainly not in the last couple of years. I agree the words were hard to read, perhaps intentionally so. Certainly had me cross eyed for a minute or two trying to work out whether the curly script letter in my one was a g or an s. I got it right though. Otherwise my email verification arrived in a few minutes and I cleared it at once. So all done and dusted as we say in these parts. There is a refresh to the right of the letters that will give you a new set. And to all those lackies saying this is the “best” science site……..it is the Uber-Best. I learn something worthwhile everytime I link to this site. I have found through cross bloging, your message is amplified by a factor of ten. When I say certain things in blogs, I sometimes hear the same exact things I said repeated on Glenn Beck and Alex Jones as well as MSM programs the following days and weeks. Expect to hear “Police State Bowl” repeated in the MSM in the coming days. Good luck – but you don’t need luck – yours IS the best site – by dint of good hard work by yourself, the mods AND all the guest writers. Congratulations on making it to the short list. We’re all FROZEN! Voted and verified, kinda. Reminded me of a Diebold voting machine when I went to the big city. I’ll consider voting for yours though its a toss-up with that other deep science blog, Women in Planetary Science, my wife being from Venus. Robertson’s is a non-starter as he’s clearly incurious and appears to lack a true scientific skepticism. Boing Boing is reminiscent of Bill Nye the Boeing guy turn hamature scientist, and Wired is to blogs as SlashDot is to ordered thought. All over the map. Dan_D, I’ve got Linux 2.6.27.7 with KDE and had to shift from Opera-63 to Firefox in order to see any selections. I have Flash and Java enabled. The vote is in for WUWT. Anthony, you’re like the Green Bay Packers – you are the best blog, the world champion, and you and your group will richly deserve the award I predict you will receive. Thanks for your fine work. Have voted. Glad to do so Anthony. Looking forward to Feb 27! voted for you, but the awards seem very skewed. A whole section devoted to one particular sin, a religion category with no Christian sites, only various neo-pagan and atheist sites, the political blogs were all left-wing, etc. This site is great. The bloggies, not so much. never got verification. checked spam and trash and all the rest. Another, verified, vote for WUWT. Voted. A nomination and even a win is nothing less than you deserve Anthony. Your writings and those of your regular contributors have taught me an awful lot. anthony, why isn’t this WUWT, which is a non-partisan website? The Huffington Post is privately owned by editor-in-chief Arianna Huffington and chairman Ken Lerer, who founded the site in 2005 with $2 million in seed capital and subsequently raised $35 million in venture funding from Greycroft Partners, Softbank Capital and Oak Investment, as well as from former AOL chief operating officer Bob Pittman. AOL will pay for $300 million of the purchase price in cash. another partisan media outlet – just what we need. A vote for WUWT verified. Well that was one hell of a process to vote. What a bloated Flash site that is. The cursor kept flicking out of the Captcha field so I had to paste the Captcha, which was as difficult to understand as usual. I’ve never heard of most of those other blogs. Of course the email was in the spam bucket, but no problem. Where are you Real Climate, Climate Progress et. al. ? Voted & verified. Good luck! I voted, found no problems with the process but saw a totally unfamiliar array of blogs to vote for apart from WUWT and Huffpo; I will be gentlemanly and not offer my opinion of the latter. Has been done Anthony. Anyway WUWT is the only one I recognize. Some previous posters noticed the nominations for best political blog are all left wing. That’s interesting. Makes you wonder about the nomination process, but it also makes you wonder if maybe there aren’t a lot of closet left wing climate skeptics around. Somebody should do an anonymous poll. We’re told climate skepticism is a right wing thing. Maybe not so much as one might think. Well done, I learn so much from your site, it is really illuminating. You deserve this award and you should really be top blog. Whats going on with this voting system? I voted yesterday and didn’t receive any message saying ‘sorry invalid email address , or sorry captcha string was wrong etc’ but rather the contrary and yet I still haven’t received the email with the validation link in. I therefore presume this means my vote has not counted and that i won’t be able to have another try? Remember, while winning is fun, as I tried to teach my son in the recent pinewood derby we did, the way you play the game is just as important. Don’t cheat. Don’t encourage cheating, and simply let the chips fall where they may. An important life lesson. Well done, Dad! Thanks for letting us know of this. It was my pleasure to vote for WUWT. I come here and I learn and I laugh. Something the whole world needs more of. You do so much; I was glad to return some small measure of appreciation by my vote. I just voted for WUWT too. Hope that it will win. Voted last night with an email address that’s a Hotmail “affiliate” (ie no Hotmail in the address) and had no verification request, nothing in my junk folder. Tried again this morning with a different email address and got an immediate response. Perhaps there’s some inbuilt aversion in the Hotmail system. Needless to say WUWT got my vote. like many others above I hadn’t heard of most of the other nominees. I too voted for WUWT. Go Anthony! My vote’s also in for WUWT, unless it’s true that the rolling ball of the mouse messes things up. BTW, I expect that WUWT made it in mostly based on the fact that you’re the reigning champion since you won for 2008 (in 2009) and they didn’t have a contest (just science or for anything?) in 2010. Probably thought it’d be stupid not to include the incumbent champ; especially when it’s numbers have continued to increase. I’m voting for WUWT, of course, but Wired is a good all around science blog (imho) and I wouldn’t be offended if they won. On the other hand, Pharyngula is little more than a hate site where militant atheists vent about how much they despise everyone who isn’t them, and doesn’t even deserve to be called a “science” blog. Saying it another way: “Trash is pretty common”. Done! Win XP / IE8 / Outlook w/ Medium high security, worked properly, verified in under 1 minute. As for the other blogs … never heard of them. Tried to vote last night with a private domain based address, still awaiting confirmation email…. Me and my girlfriend have voted for Real Climate . . .
Oh No, that isn’t right *grin* . .
Well done Anthony this is a great site and a service to all who want to add to Watt they know ( geddit ). Anthony: Congrats for being a finalist! I have voted for you-know-who and am awaiting confirmation. Funny that RC didn’t make the cut! Voted. Best of luck Anthony. This site is one of my daily visits. Pleased you made the final, Anthony, and here’s wishing you well for a brilliant result. My vote is in and I’m sure all your regular followers will be up for it too – only takes a couple of minutes to cast your vote! I voted yesterday and again today. Yet to receive confirmation … still waiting. Vote was registered by Nikolai Nolan after querying whether to revote. If free people allow this CO2 fraud, they will have by choice fenced themselves onto the grand socialist reservation. We Apache and many other tribe members can advise you clear, reservations are not a good thing except for a few chiefs and their enablers. Much like Washington D.C. . Despite the proliferation of sites/categories only WUWT was worthy of a vote IMHO. If Huffington is worth $300+Million then WUWT is way above that figure! RC didn’t make the cut because it isn’t a science blog. They routinely censors any postings that don’t fit their belief system. RC operates more like the Moonies, though perhaps that is an insult to the Moonies. They will try and convert you, and if you are converted you are welcome. If not, you will be censored. This limits debate until it takes on religious aspects. With regard to cursor keys. When filing in forms you should make your selection or fill in what you want and then click on non active region of the page. This will release you from the input mode. Use the cursor keys to scroll down to the next section and click within the input box and enter any details needed. This is true of many entry forms. You must escape the input mode before scrolling using the arrow keys. Ok, I’ve had another go and this time I got the verification email and clicked the link and it worked. I’ve also got all my five kids to vote for WUWT as well and, as Anthony asked I’ve put up a thread on Digging in The Clay to publise the fact that WUWT has been nominated and to encourage visitors to DITC to vote for WUWT. Done and verified. Best of luck. Excellent job Anthony! As stated by many above let me echo: You deserve to win. Thank you and keep up the good work. Been and voted – I dodn’t recognise any of the other sites on there – but then I am not much of a surfer dude! Good luck – and well deserved for being a finalist in any event. 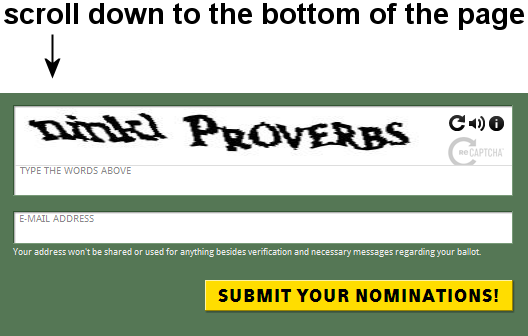 I am unable to enter the words of the captcha on that site. I click in the field and my cursor disappears and I’m unable to type anything there. Protip: If for some reason, like me, your cursor disappears in the field to enter the captcha, hold your mouse button down with the cursor there. you can then type the words in…. more nonobvious, non-standard HTML BS. Voted and verified! Good luck!!!! Well nothing is more infuriating or frustrating, than instructions that are like a Japanese Transistor Radio Manual. So I went to the science blog page, and there was a place for my e-mail, which I enetered and thena panel for what question I wanted to ask which was nothing; I simply wanted to vote. So i scroleld all the way to the bottom, and found nothing there. In particular I did not find ANY blog logos, which had little round tags to click on; mine all had little square tags; and I clicked on the one for my candidate; and absolutely nothing happened; no check mark came up in the little round box which wasn’t there, nor in the square box that was there. Finally my cursor drifted over and highlighted the name of the blog, so I clicked on that. I then scroleld down to the bottom, and found th scribbly letters and another place for my e-mail. I tried to type in my e-mail but it wouldn’t enter anything. Then I tried to type the scribbles but there was somelthign that could be either ul or wl run together, and I entered ul. It wouldn’t let me type in my e-mail. So I clicked on the recirculate button and it changed the scribbles; but now it wouldn’t let me type in either box. So nuts to whoever designed that thing; like I say; Japanese Transistor Radio Manuals are far more intelligent. I’m one of your new visitors courtesy of your ’2011 Bloggies’ nomination. I have a sincere request. Please don’t use the term ‘denier’ when referring to people like myself who question the claimed ‘settled science’ on man-caused climate change, in particular the claim that if mankind does not immediately constrain/control mankind’s use of fossil fuels within the next few decades that we will reach a climatic ‘tipping point’ that leads to catastrophic anthropogenic global warming (CAGW). Skeptics (so called ‘climate change deniers’) and more precisely CAGW skeptics like myself most definitely do not deny ‘climate change’. Far from it – in fact it is those who deny the existence of the Medieval Warm Period (MWP) and Little Ice Age (LIA) who are IMO the real ‘climate change deniers’. Climate change has always and will always as our climate has never been nor ever will be in equilibrium. I’ve a degree level educated ex-nuclear physicist so I’m never going to ‘deny’ the reality of greenhouse gas radiative physics. What I object to is the hyping and warping/extrapolation of this well understood and acknowledged (settled bit of science if you like) branch of physics into a global ‘we must save the planet’ catastrophy issue via the use of global climate model ‘projections’ that assume with NO actual verifiable evidence that water vapour is a strong net positive feedback to CO2′s so called forcing. Somehow or other skeptical scientists like myself are supposed to accept that an odourless, tasteless, gas (that is essential to continued existence of all life on our planet) that is present in our atmosphere at a concentration less than 400 PARTS PER MILLION determines whether or not our planet warms or cools rapidly? It quiet sad really as in this thread at the top he links to his/your fellow nominees but deliberately doesn’t link to WUWT. Why not? I received no verification yesterday , so voted again today . The verification came almost immediately , but the link didn’t work . I typed the URL into my browser and I got the web site . Is that all there is to it ? I saw no link to the bloggies per se . Another confirmed vote for WUWT. No hesitation. Re-submitted and the confirmation came up straight away this time. Congrats Anthony on this nomination by the way. “Arid regions are influencing their weather using electrical technology. Closest to center is the occasionally objective Politico (with only NINE JournoList members). Don’t know how that could happen if they are honest brokers. Done – good luck to WUWT and all involved!! I used XP & Firefox. Confirmation was within a minute. My vote’s in for you! Good luck! My vote for WUWT and all your sterling work; and the hope that the final result will break down a few more “settled” walls! Did it using internet explorer, their submit button did not work on my Chrome. Voted for WUWT good luck Anthony. You just have to click on the rectangular icon behind the little round ballot point; it sends you to that blog. I found that out by clicking on the WUWT icon and got sent to this familiar site, so I had to go back and vote properly. I didn’t recognize any other sites except Wired, and so had a look at a few of them. I will browse a bit more, and if there are any that I add to my favorite list then I might vote for them. How did this site even get nominated, this is not a ‘science’ blog, it is merely a one-trick pony gossip and slander site. The email address works fine Anthony. I used to the same address to vote in these awards (for a site that actually publishes a wide variety of science articles). For the record, my real name is Paul. Good Luck in the awards, which are incidentally nothing more than a popularity contest as opposed to a measure of material quality. I got my confirmation e-mail — but it was tentatively labeled spam, and might have ended up in my junk box if the sensitivity were set a little higher. Be sure you get your confirmation e-mail and click the link! Done and verified.Good luck Anthony and mods. Thanks for your full name? I would regard the science blog award voting basis to be more qualitatively substantive than that last USA presidential election; which was a real popularity contest with lack of material quality presented by the victorious candidate. Anthony, I agree 100% with the above. I have been looking in vain for a response. Please do not be shy about it. We want you to have more family time and not burn out. Good luck, Anthony, guest posters and mods. I do believe that the tide has turned … and I doubt that it would have happened (so much faster than we thought?!) without your dedication and hard work. Voted for WUWT and verified. I also logged on to BoingBoing and said I voted for WUWT. A pox on BoingBoing and their progeny! Voted, verified, danced a little jig. Good luck WUWT. You already have my vote. Keep up the good work! Another verified vote in, this morning. Thanks for your suggestion to take a look around the other nominated sites, Anthony, which was why I waited so long – some of them had me laughing out loud and led me to vote for them, too. I shall be checking them out in future, when I’m in ‘relaxation’ mode. About those scrolling problems (using Firefox / XP in my case) – I found that if you click on the background of the page, after making your selection, it doesn’t then mess up your voting choice and you can (if you must) use the arrow keys to scroll the page. Agree it’s a weird bit of coding though. So, now we all sit and wait. Good luck! I contemplated using Mike’s Nature trick on my vote, but in then I realised that the hockey stick will be self evident. Keep up the great work Anthony, from the soggy end of the La Nina, Aus. Voting accomplished.Was Realclimate even dissed from the best religious blog nominations.Not their year.Shame. This kind of contest is very near to the democratic centralism – this is how the communist countries defined democracy . Everybody has indeed the right to vote and the freedom to vote . There is just this little bug that people can only vote for a list that the communist mafia bosses decided among themselves. Then it is fully natural that a free election gives a democratic result that 99,9% vote for the Mafia. Same thing here – all political blogs were selected (by whom and how?) between far left and left. Also the best religious blog will be atheistic with a crushing majority of 100% . I wondered some time ago about a “representative” poll commented on all major french media and according to which the personality preferred by the French was Mr X.Y . Now Mr X.Y is an uneducated moron who has been genetically favoured with an ability to play tenis. He has also a big mouth , almost as big as Al Gore , and likes to open it often to give his uninformed opinion about anything to worshipping media. In short Mr X.Y is a useless parasit with an IQ of an oyster . I wondered how such a parasit could finish “preferred” personality of 60 million of people so I had a look at the poll . As expected it was the democratic centralism at work again – the journalists have preselected exclusively showbiz , media and sport people . And that’s how the “preferred” personality turned out to be necessarily an uneducated parasite . Anthony, you got my vote. Thank you again for the Herculean effort you have made these last few years. You may have saved the planet. Literally. Voted and confirmed, you are a daily routine for me. mostly just lurk but sometimes give opinion. Great job, this is the best teaching/learning science blog on the web bar none. Congrats, vote cast and confirmed. Have the other spurned sites, like R.C. brought in their lawyers yet? Seriously, after Drudge, to see if we are still alive, I go to WUWT. Keep up the great work. You said a mouthful of truth. We all know if it were an open ballot, WUWT would have won outright. The political sites were a joke. What’s with the gay etc. category? Where are the guns & hunting sites or the historical sites? Why is Puffington’s Ghost everywhere? Shows their huge biases, right off the bat just with the topics, never mind the choices. For them to allow WUWT to creep in, they must have seen the elephant in the corner of the room. Anthony, I tried to vote but could not – there were square boxes near the nominees, not round ones, and when I tried to click on the square, nothing happened! Any suggestions? 5. If you don’t want to do this on your main browser, try downloading and installing another temporarily. You have my vote and it has been verified. Well done Anthony. Voted instantly and verified without any trouble. Incidentally, I have used Linux and Firefox for years and years (as everyone who loves freedom should) and I had no trouble at all. Simply followed your lucid explanation of what needed to be done. Voted. Verification takes awhile, but done. Done and I’ve asked my friends to do the same. Congratulations, Anthony. Voted. No issues. Makes me smile to think how steamed Joe Romm must be. Voted and immediately verified. Not sure what the point is because your counter rather says it all. Okay, so no reason not to go for the $20.11. That reminds me…time to go to the tip jar again. One more vote for WUWT. Thanks for the voting instructions. You made it simple. Good luck. Done. Keep up the good work please! If you win the $20.11 I hope you will not let it alter your life! Done, used Safari – it works well enough for me. Once again I want to thant Anthony for this site, where I too learned a lot! The suggestion that WUWT is not a science blog tells a lot about the person who made it – and what it tells is nothing to be proud of. Keep up the good work, all the best to Anthony, all the mods & bloggers! Voted and confirmed, for the best antipseudoscientificalism site around, WUWT. Vote cast……best of luck Anthony. The guest posters, moderators and you have helped usher in a new era of journalism that quite literally has advanced the causes of truth, liberty and personal freedom. You have my sincere gratitude for your efforts. Finally getting my verifications and voting daily as allowed. Thanks for the information Anthony. It worked and my vote is in. Voted and verified. WUWT is my favourite blog. attempted rebuttal! Good luck, Anthony! Win or lose, just keep on going. So no advantage to multiple votings. I think you can vote once for each email address? OK, WUWT got my vote obviously. But now I’m mad….I had to check out all those blogs before casting my vote in other categories. Some are pretty good and I know I’ll be back again….like I don’t already waste enough time here and at Junkscience. And Failblog. And Funny Engrish. Vote cast and verified. Good luck! I’ve cast my vote in your sole favour, since yours is the only blog I visit on a regular and frequent basis. When I do visit other blogs I judge it by the standard of this one. Least I can do. Good luck! Noticed Huffington Post in the political section. It’s just been bought by Google! There goes their independent credibility! Unlucky. Hope you never get taken over by Google. Ah thank you Lief, I didn’t fully read their instructions. I voted for WUWT all the best! just voted for you! and confirmed it. I hope you win the award, but you’re already a big winner without the title. for misspelling your name above. p.s. Bet Brian H will have already caught that. science? There’s science here? Who knew!!! Please don’t “unsticky” this until you absolutely must. Maybe even the day before, or after 😉 the poll closes. Many of our friends only visit when they can and everyone should be made aware that we have another great opportunity for exposing the idiotologists, the vested and the willfully blind (such as peetee above) and attracting yet more scientists to the debate that some would rather stifle. ‘First they ignore you, then they laugh at you, then they attack you, then…you win.’ Ghandi. Can we take this post off “top of page banner” status? Love the blog, but am tired of the distraction. Have voted above but submit button doesn’t respond. Voted but never received verification message. Left a message on the site. Nothing received back. I give up. Congratulations on the nomination Anthony! I have voted and confirmed. Can’t believe the climate fear drivel on BoingBoing. I’m afraid there is no hope of rational, independent thought ever reaching these folks. I was looking vote for RC in the best Sci-Fi, but couldn’t seem to find them. WUWT has my vote, keep up the fine work. I added a short comment at BoingBoing Feb 19 at 1805AST. I’ll check later to see if they had the guts to post it. Made four attempts to vote, but no confirmation e-mails whatsoever were received. It appears we’re all shut out of the voting around here. Exact same thing happened to me!!!!!!!!!! I even tried voting in other categories so that I voted for more than just WUWT, no confirmation, not even in the junk email folder. I hear the RC BoreHole has a chance for Best Science. RC itself is this year’s run away winner for Biggest Waste of Time. Warning: Anonymous messages are held for moderation. This could take a (long) while. Or your comment may not be posted at all. Please consider creating an account and logging in. It’s fast, free, and we don’t spam, ever.